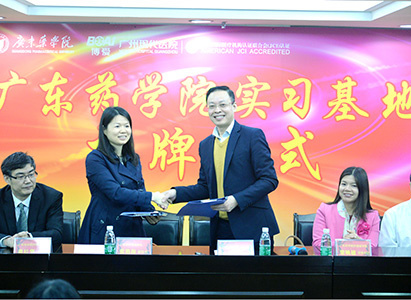 On March 10th, “the Awarding Ceremony of Guangdong Pharmaceutical University Education Base “was held in Modern Hospital Guangzhou”. 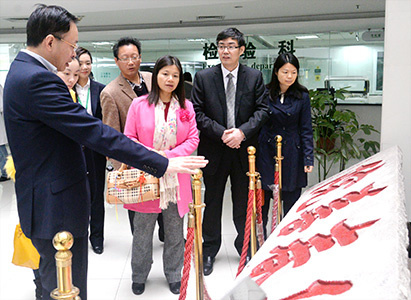 Some leaders of the university, first batch of intern students and President of Modern Hospital Guangzhou as well as other leaders of the hospital witnessed the ceremony. During the ceremony, President Wang Huaizhong introduced that Modern Cancer Hospital Guangzhou is an international comprehensive hospital based on the domestics and develop overseas. Since 2005, the management and the development of the hospital has been remarkable and has received many honorary titles such as “the Top 20 Sustainable Development Unit of Guangdong”, “ Gold Medal Hospital of Minimally Invasive Treatments”, “JCI International Accreditation Hospital” .President Wang also said that the two parties hope to take this ceremony as a chance to speed up the resource sharing and promote the development of the education base to train more qualified and creative talents. Ms.Zhang Yanmei, the deputy director of the Academic Affairs office of Guangdong Pharmaceutical University thinks that as a well-known foreign involved hospital in South China, Modern Hospital Guangzhou's hospital concepts coincide with the Guangdong Pharmaceutical University's school mission and targets especially with their Foreign Language Institute. To choose Modern Cancer Hospital Guangzhou as the university's education base is a move to both realize the complementary advantages and mutual development. Gong Zhanghua, Dean of the Foreign Language Insitute of Duangdong Pharmaceutical University said that Modern Hospital Guangzhou enjoys a wide social reputation and the work attitude of the hospital staff convinced him that the university students can well complete their intern task here and enhance their ability and develop their potential to the maximum. 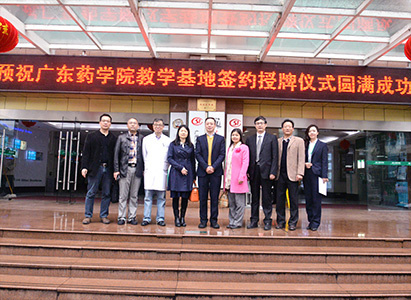 After the awarding ceremony, with the companion of the president, vise president and other leaders of the hospital, the representatives of Guangdong Pharmaceutical University visit Modern Cancer Hospital Guangzhou.